Would you like to go green on your wedding day? Perhaps you are worried there are few or no options available, apart from forcing your guests to eat out of date food like this couple from Cambridgeshire did! If looking after the environment is important to you and your special day is looming, why shouldn’t you go for the greener option? It is perfectly achievable and these are some simple, actionable tips for finding eco-friendly flowers and table decorations for your big day. The problem with a lot of wedding flowers is that they are made overseas and filled with nasty fertilizers, which are not good for the environment. If you want to use eco-friendly wedding flowers instead, make sure you source them from local companies. Local wedding flowers will be chemical free and all the better if they are in-season. This is also a good way to support local businesses and it can be a handy cost saver too. Flowers shipped from abroad often have expensive costs attached to them and let’s face it, weddings are expensive enough! The British Flower Collective can help you to find local growers. Smokebush Floral Design are a new business local to Macclesfield. Creative and stunning displays from local flowers. One other source local option is to ask around neighbours and friends who have a lovely flower garden! 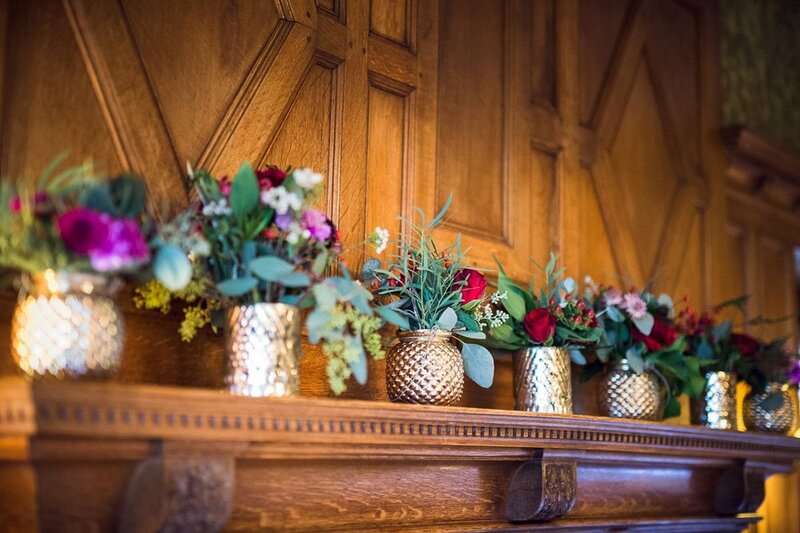 This is what Hannah (The Conscious Bride owner) and Ben did to decorate their local chapel. Pick greenery from your garden or around your venue. It is a good idea to try reusable options, such as potted blooms or plants for your table dressing, as these can be used again for another occasion or even given to your guests as favours for your guests. Topiaries are also another option, as these can be replanted. An alternative option is dried flowers and these are quite commonly used these days. These can even be taken home by your bridesmaids, making them the perfect keepsake of the big day. Dried flower crowns, button holes and more are available for delivery from the Artisan dried flower company. You can see Hannah wearing one of their crowns on the blog. If you are a keen gardener, you may want to consider growing your own, so they are ready when you need them. Not only is this better for the environment, it is also a cost saver and a good way to ensure you get the flowers you have set your heart on. Your bouquets don’t actually need to be made of flowers at all, so why not put your own unique spin on them by creating something completely different. Flowers are the traditional option, but there are plenty of alternatives. Some possibilities include a brooch bouquet, or origami bouquet, which are the perfect option for those who prefer to be a bit more creative. A feather bouquet is another popular option and you can use really emphasise the dresses by using colours which ‘pop!’ You may even want to try something completely alternative to the traditional bouquet, such as an arm garland, clutch bag or a vintage fan. It’s your wedding and there are lots of alternative eco-friendly options available – so rather than stick to the standard ideas, why not use your creativity to really make your wedding stand out. Eco-friendly, attractive options for your centrepieces could be those which are hand crafted, such as driftwood, beach stone or seashells. You can find exactly what you want if you just look around your local area and with a bit of creativity, you can create decorations which will be the envy of all your guests. The use of completely natural materials can really make your tables stand out, while still being environmentally friendly. Got a romantic venue? Then skip the flowers and create drama with candles. Idea from Elizabeth Anne designs. Wedding invitations – why not use recycled paper for your wedding invites or go one step further and refrain from sending wedding invitations altogether. With the technology we have at our fingertips these days, online wedding invitations are becoming increasingly common. Not only is this option better for the environment, it can be a more reliable way to get RSVP’s. Why not send out email invites and create a Facebook event, so people can respond this way, instead of sending RSVP’s in the post. You are more likely to get responses and save money in the process. Dress – after your wedding, you’d hope that you no longer have a need for the dress and as so many people are in this predicament, there are plenty of recycled wedding dresses to choose from. This is obviously an eco-friendlier option (and also much cheaper) than buying a brand-new wedding dress. Or choose one of The Conscious Brides' our eco-friendly dresses from the Sanyukta or Celia Grace collections. Some of the dresses can be restyled to create a new wearable gown. For example our Esperia gown could be coloured and made knee length. Keep the chopped off silk for future generations. Food – why not try your local farmers market for food options for the big day or even grow your own, if you are that way inclined! So much food goes to waste at weddings so make sure you don’t overdo it either; nothing worse than throwing a heap of food in the waste! Venues – consider the eco-friendly options. Could the venue be outside in a local park, forest or even an organic farm? Look around and see what the most viable, local and environmentally friendly options are. If you want to stay on top of the latest wedding trends for 2018, websites like the Wedding Journal will provide you with lots of handy tips! Find out what’s hot…and what’s not! Check out our new directory hosting only the best venues and reputable wedding suppliers across Ireland and NI.